Remember when people used to set their beverages and snacks down on end and coffee tables? In this age of Netflix and Chill we don't have any extra energy to devote to reaching. Ideally our beverages would be right next to use with a comically, albeit perfectly sized, long straw to keep us from having to waste a single calorie. 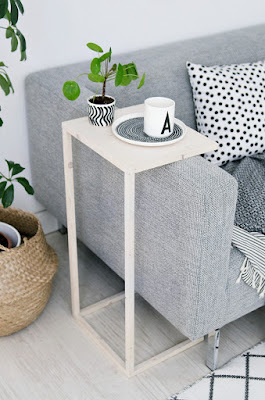 Furniture peeps have caught on and begun shilling adorable couch tables. By adorable, I mean grossly overpriced. and posted directions so you can make me one too.